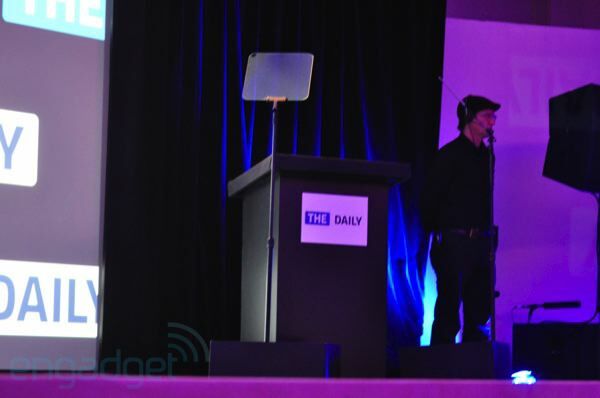 Is the future of media an iPad-exclusive daily newspaper that's delivered automatically overnight using a new subscription service? 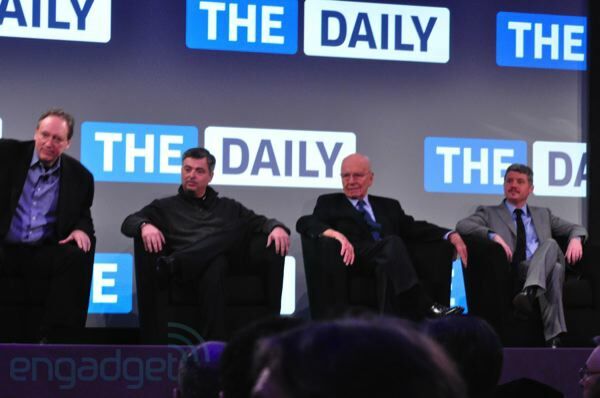 We're here at the Guggenheim Museum in New York for the launch of News Corp's The Daily to find out -- and Apple's VP of internet services Eddy Cue is scheduled to join Rupert Murdoch on stage, so things could get interesting. Join us, won't you? 11:49AM And we're done! 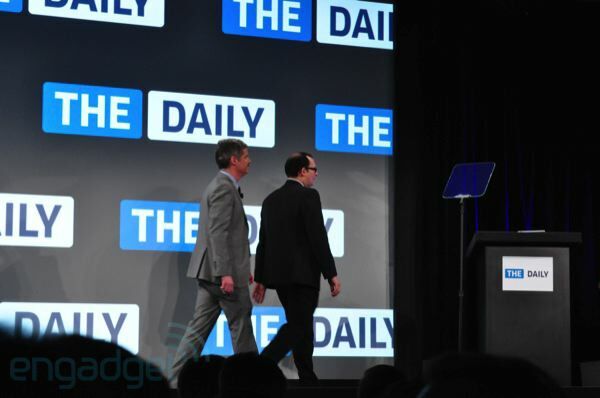 The Daily will be live in about 10 minutes, we're told. 11:48AM What's the split between ads and subscription revenue? It'll be more subscription at first, and then it'll go towards that magic 50/50. 11:48AM Can you talk about having consumers paying for subscriptions when there's a lot of demand from advertisers -- how big could the audience have been if you made it free? 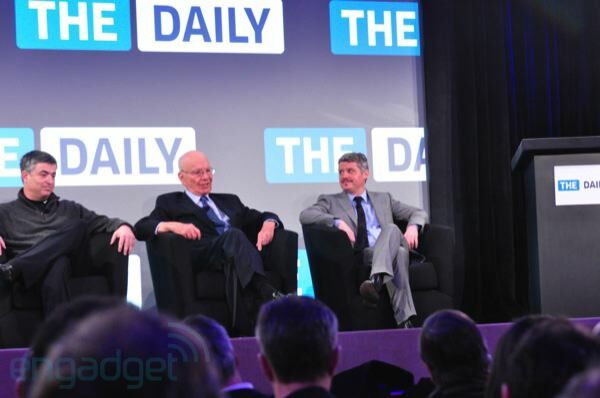 Rupert: I think advertisers would pay a much lower rate if it were free. It's better for advertisers -- we'll draw a better class of advertisers at a better rate. 11:47AM Newspapers tend to be targets up-and-down market, tabloids and broadsheets -- where are you targeting this? Jesse: That was the first question our publisher asked Rupert, and Rupert said, well, everybody. 11:44AM What's the editorial mix between news and features? Jesse: read it and find out. I haven't said it's fixed. 11:44AM Will The Daily be free on the web? You can see a page for free if you have a link, but you can't go to thedaily.com and see all the pages for free. 11:43AM Will any of this stuff be on the web? 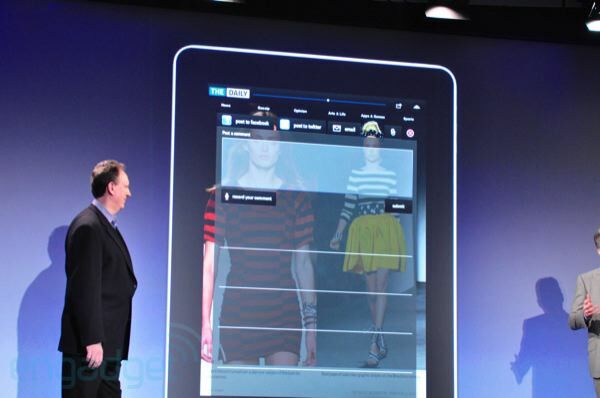 Jesse: Not everything you can do on the iPad can be replicated on the web. A feature that's built on touch UI doesn't make sense on the web. 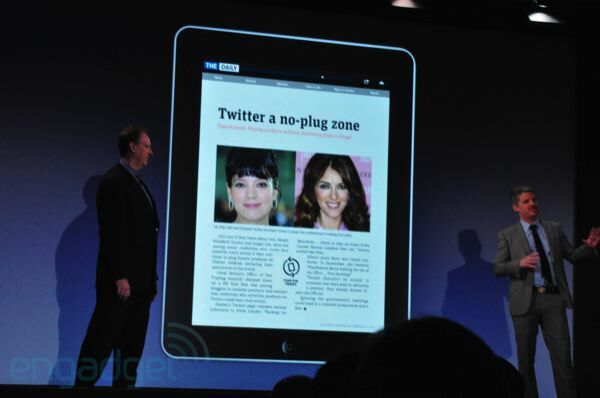 Text, headlines, pictures, that shareable on the web. So where we can do it, we make HTML pages that are on the web -- they're out there. We can use them to share and promote our content. 11:42AM How is this content discoverable on the web? How will search engines get it? 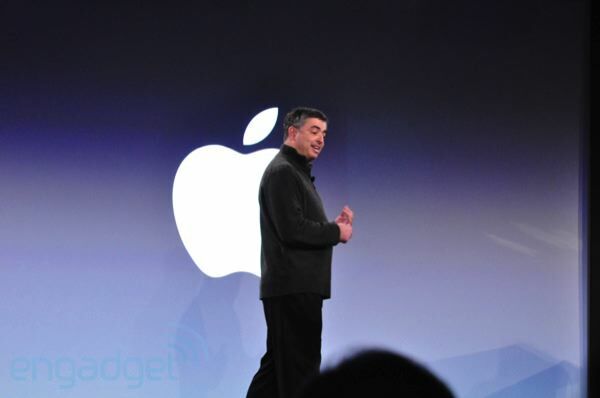 Eddy Cue: We've had 10 billion apps downloaded, I think people are finding them. John: We feel good about it. We've focused on this medium and this device. We didn't want to make compromises, and the web demands that you make sacrifices. 11:41AM Has Steve Jobs said anything about the product? Murdoch: Steve called me last week and said that the app was really terrific, he was extremely flattering. 11:40AM What's the voice? Jesse: If you want people to come back, you have to make them think and make them smile. Need a little bit of wit, a little bit of attitude. How do you create content for people using this device? 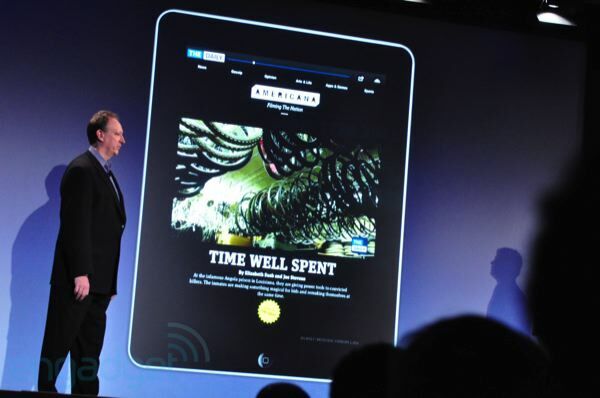 People spend 30, 35, 45 minutes with their iPad -- do we create content that's compelling enough to hold that attention? 11:39AM What are your favorite apps besides New Corp apps? Murdoch: I try playing some of the games, but my 7 year old beat me every time. 11:38AM How long do you anticipate exclusively being on the iPad given other tablets, and are you married to Apple? 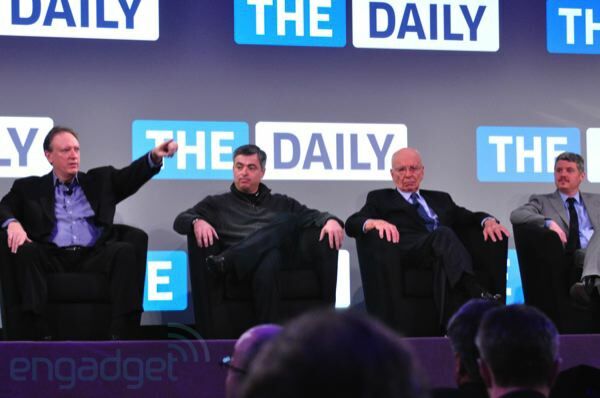 Murdoch: We've been quite honest with Apple, and we'll be on all major tablets. 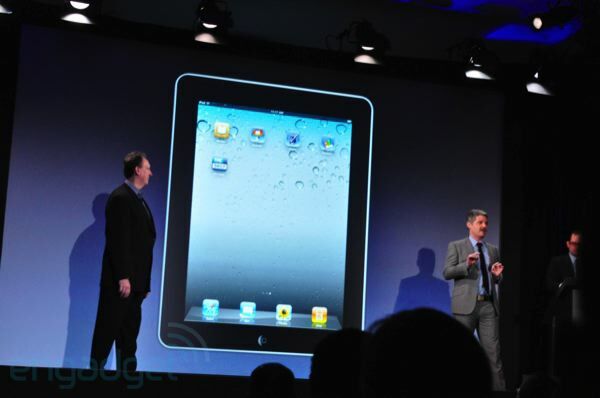 But we think last year, this year, and next year will belong to the iPad. 11:37AM Why choose to focus on the Daily and not an existing brand like WSJ? 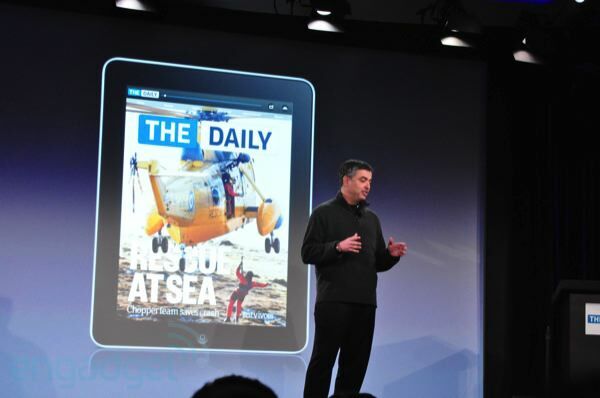 Murdoch: The WSJ was the first paper to be a paid app, and it was my excitement about that and how good it looked that made me consider what could be done on a tablet. 11:36AM What about an Australian version of the Daily? Murdoch: Mumble mumble. 11:36AM What is the political tone of the Daily, will it be more centrist? 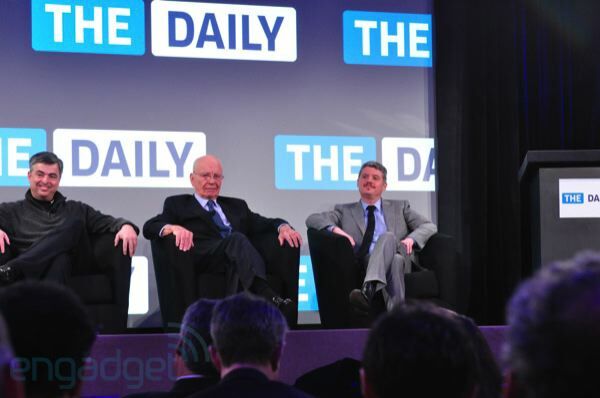 Murdoch: the editorial position will be in the hands of the editor. Jesse: We wanted a new brand. We're patriotic, we love America. We believe in free speech. As for specific editorials, well read it. You'll be surprised. 11:34AM How do you break in for breaking news, and how do you avoid overwhelming people? Lots of different ways to do breaking news -- tickers, twitter feeds, drop in new pages. We can change the front page whenever we want. This isn't a static product. But at the same time, as a consumer I don't like everything changing all the time. 11:33AM Rupert: Just take NY alone. We have two morning shows competing with each other, we have the WSJ, the New York Post, they're all competitive. 11:32AM What are your main competitors? 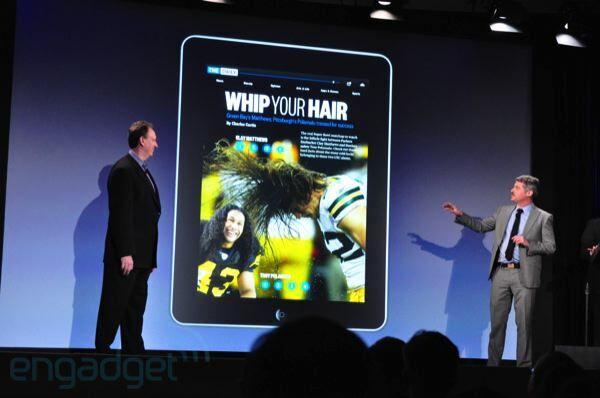 You have to compete with everything now -- that's especially true on the iPad. You have to compete with Angry Birds on some level. That's part of the reason that we've focused on the voice, the style, the use of media. 11:32AM Asking about the Sony Reader snafu yesterday. 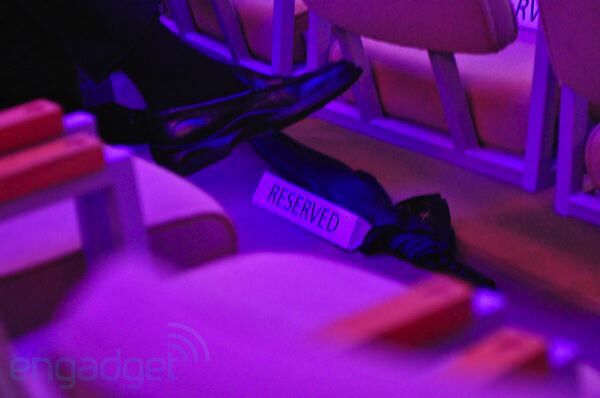 Eddy Cue: Don't want to talk about the announcement yet, but we'll talk about that soon. We want customers to be happy. 11:31AM How will you determine is this is successful? Murdoch: Yes, when we sell millions. Our ambitions are very big but our costs are very low. We've spent $30 million so far, but it will be running at a cost of half a million a week. We're very confident. 11:29AM How will you measure readership for advertisers? We love advertisers, and we have tech to measure all the metrics they require. 11:29AM When will the subscription model be available to other publishers? 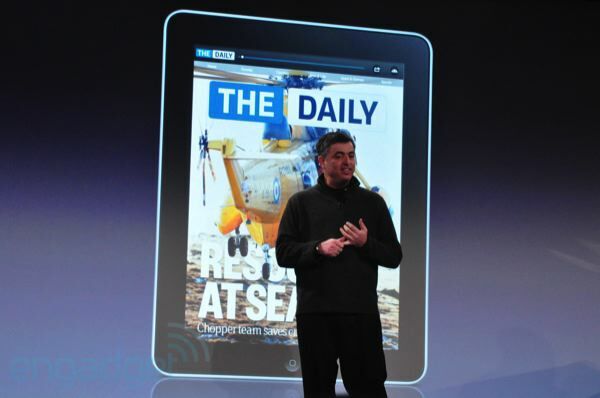 Eddy Cue: Available on the Daily today, and there'll be an announcement for other publishers soon. 11:27AM They're struggling some chairs onto the stage for the Q&A, and the lights have gone deep, deep blue. We're about to get groovy in Murdoch town. 11:26AM And that's that! They're doing a group photo and then it's Q&A time. 11:25AM "We've built a whole new subscription billing that's as easy as one click. You'll be billed weekly at 99 cents or yearly at $39.99." 11:25AM "You don't have to live in Wisconsin to get the Green Bay Packers as the home team in your paper." Okay, now he's speaking our language. 11:24AM "I've been lucky enough to be using it for the last two weeks and it's amazing. Something of this production value done every day." 11:24AM "From the first day we met with Rupert and his team, we knew they were going to redefine the news." 11:23AM "In the past year, the iPad has launched a whole new category of mobile device... there are over 5000 new apps for iOS. 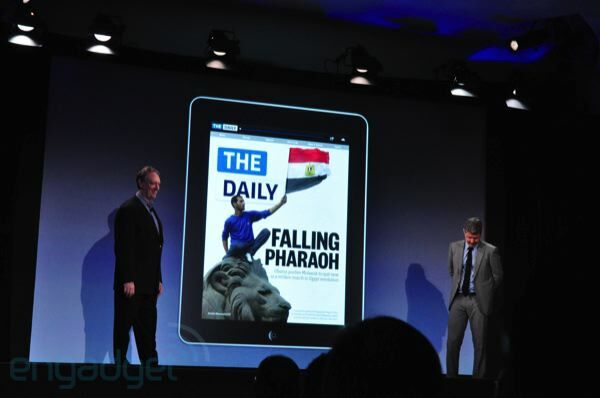 iPad customers are huge consumers of news." 11:23AM "We are thrilled to be here today to help News Corp launch the first national news publication built from the ground up for the iPad." 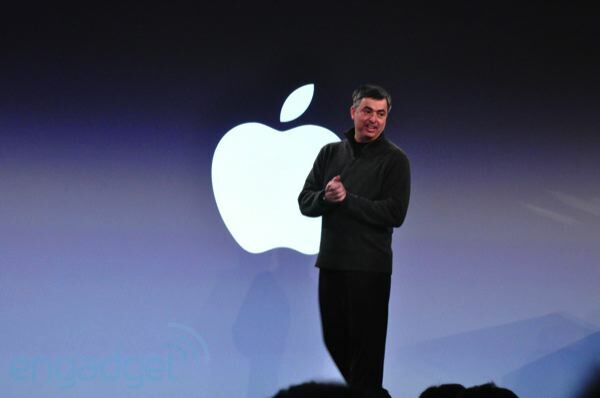 11:22AM Eddy Cue from Apple now on stage. 11:22AM The Daily publishes every morning, with breaking news at every time. 99 cents a week with deals on the way. First two weeks are free courtesy of Verizon. 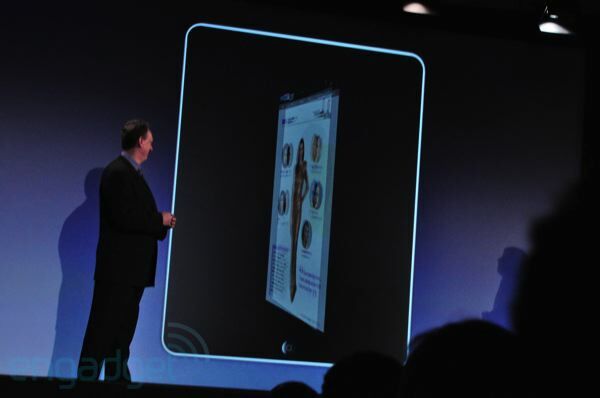 11:21AM Talking about touch UI -- they say it's great for adding interactivity to things like sports coverage. 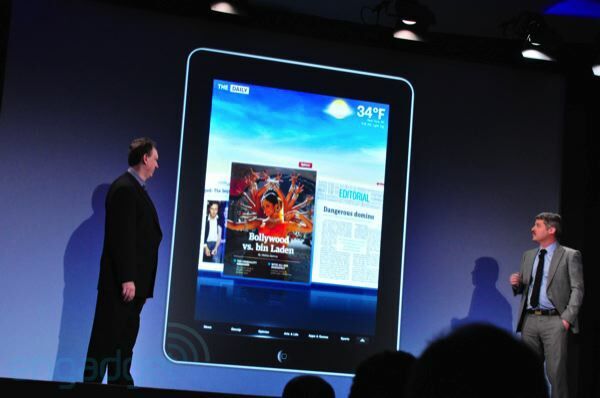 Sports pages are customizable for teams and players. 11:20AM There's an apps and games section with reviews and ratings -- it's linked right into the App Store. 11:19AM Showing off web integration -- in addition to links and the built-in browser, there are built-in Twitter feeds on certain pages. 11:19AM You can share articles on Facebook, Twitter, and email. "The Daily is not an island." Showing off the share screen now -- you can record audio comments as well as the usual stuff. 11:18AM Showing off the carousel, a CoverFlow-like view of the pages. There's a shuffle button to bring up new stories you haven't read, an audio button that reads to you like the radio, and a TV-style news anchor. 11:17AM "I think what you're seeing is the first all-media product... we're going to produce up to 100 pages everyday. How do you get through all that? 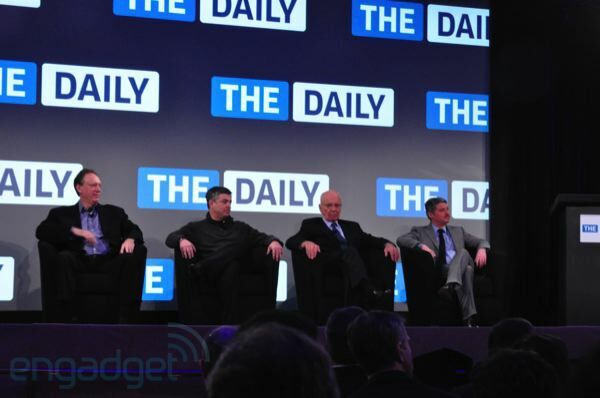 We've come up with some innovative ways to find content in the Daily." 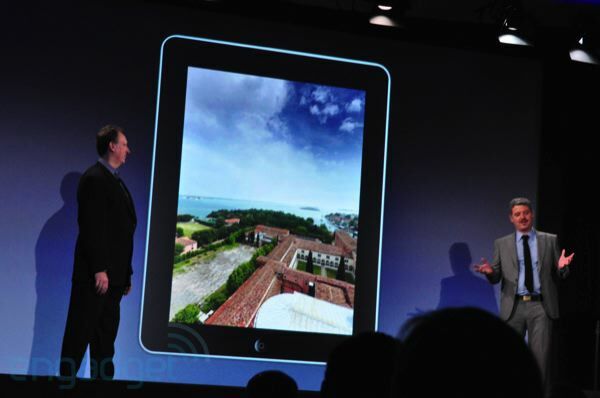 11:16AM Showing off 360-degree photographs and HD videos -- they'll have new content every day. 11:15AM "We have people from television, from newspapers and magazines, working hand in hand with designers and developers. 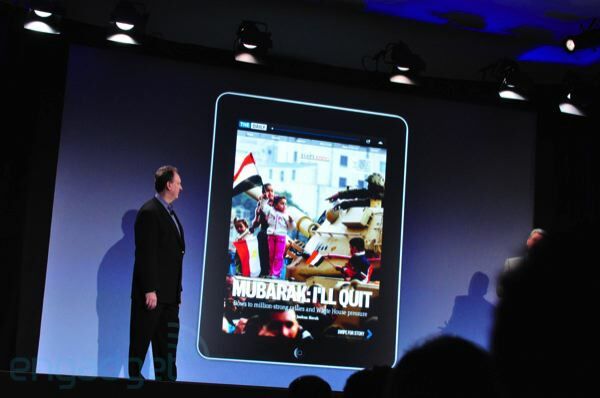 The iPad allows us to tell stories in different ways than we did before." 11:15AM "We've been doing live production for about six weeks now... the staff of the Daily is fantastic, and they've been working around the clock." Showing off the Egypt package. "It's the kind of story that's made for the Daily -- the pictures and video are amazing." 11:13AM "We've taken a fresh look at what it means to tell a story." 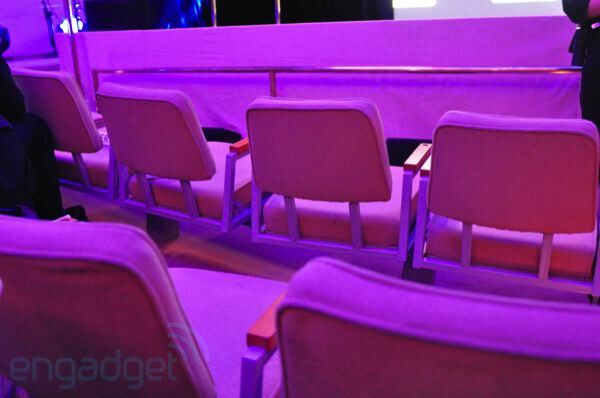 These are going to be live demos of real content. 11:13AM "Now it's my pleasure to introduce John, Jesse, and Greg to unveil the first edition of The Daily." 11:12AM "The Daily's success will be determined by its utility and its originality... The Daily is not a legacy brand. We have a license to experiment, and a duty to innovate. 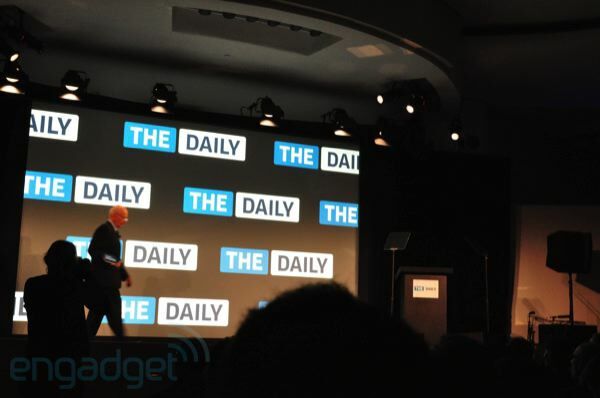 We believe the Daily will be the model for how stories are told and distributed." 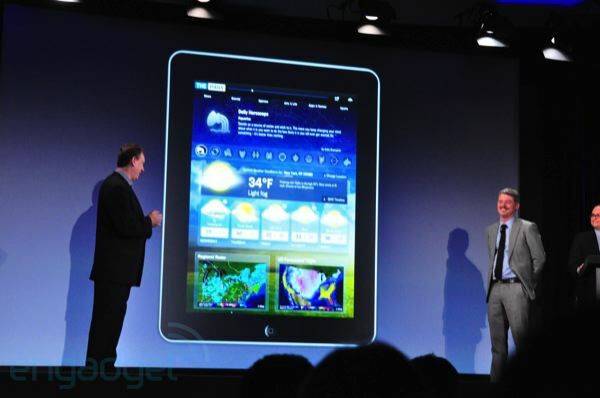 11:11AM "Our target audience is the more than 15 million Americans who are expected to own tablets in the next year." 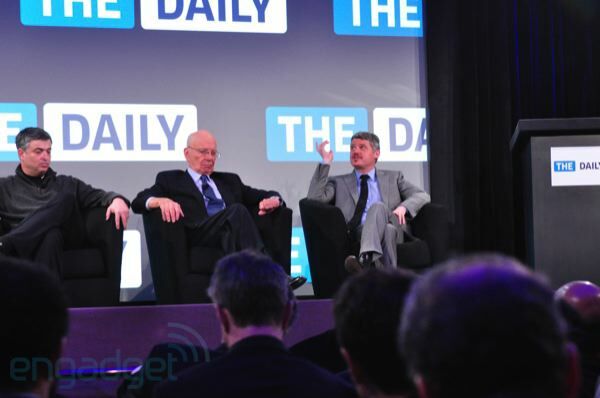 11:11AM The Daily will be just 14 cents a day -- there are no costs for paper, presses, trucks. 11:10AM "Our aim is for The Daily to be the indispensable source for news, information, and entertainment." 11:09AM "The magic of good newspapers -- and good blogs -- is a deft editor's touch." 11:09AM "There is a growing segment of educated and sophisticated consumers who do not read daily newspapers, but still consume media. This restricts their interests to what has been predefined." 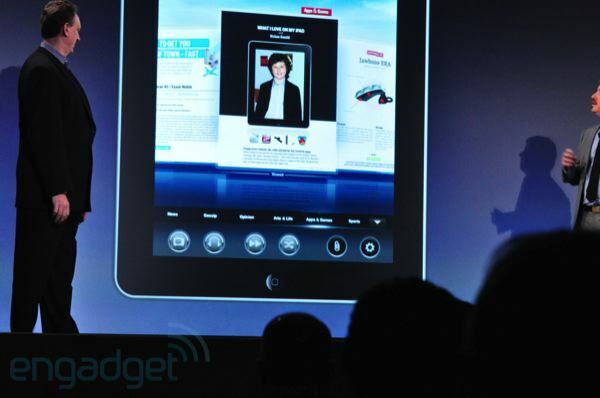 11:08AM "Simply put, the iPad demands that we completely reimagine our craft." 11:08AM "New times require new journalism. 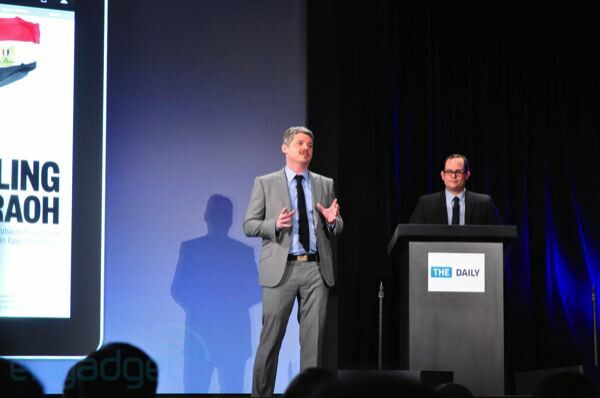 Our challenge was to take the best of conventional journalism... and combine it with the best of new technology." 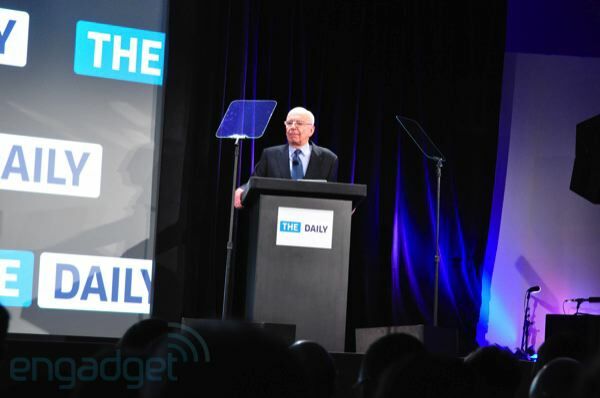 11:07AM "Good morning, I'm Rupert Murdoch and I'm here to welcome you to the launch of The Daily... first I would like to thank Steve Jobs. He's given us this incredible new tablet and given us a new platform. 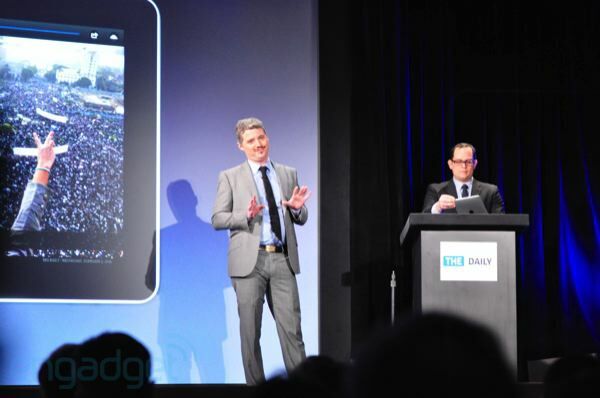 Steve has been a champion of The Daily since day one, along with the brilliant Eddy Cue." 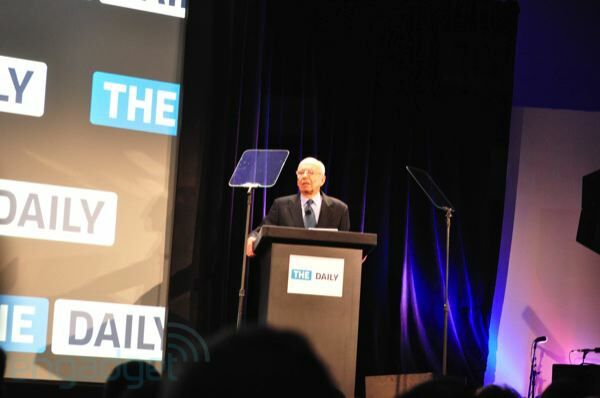 11:06AM And Rupert Murdoch is on stage! A PR person is yelling "Rupert Murdoch!" 11:06AM Okay, the lights are going down -- here we go. 10:57AM The music has perked up with some Caribbean syncopation. If there were any people in this room it would be a real party. 10:49AM We're hearing the actual The Daily app is scheduled to go live at noon, but history suggests it'll go a bit earlier than that. We'll keep an eye on things. 10:44AM It's a pretty nasty day of sleet and snow here in New York and this room is surprisingly empty -- we'd say almost half the seats are empty with 15 minutes to go, and we've heard Rupert Murdoch has canceled a bunch of post-event interviews due to the weather. But we're here. Because we love you. And there were snacks. 10:42AM We're here and sitting down in very comfortable chairs. They are playing extremely chill jams, and the room is lit an a deep purplish-blue. It's kind of like the ultimate 1970s airport lounge experience. Missing: live percussion.